Could you recreate a goddess on a mortal? Well, I can on Ashlie. She’s my great niece, and my Sherrie’s daughter. 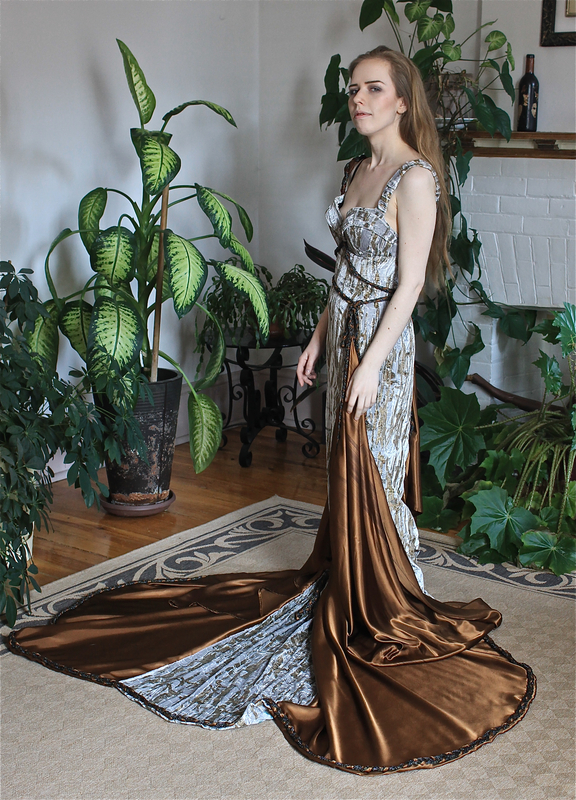 She is not a model, but embraced the Goddess Artemis when she put on the “Artemis by Moonlight” Art Gown. Stephanie, our official Art Gowns photographer, is away on assignment. As Ashlie was only here a few days, I took the pics. Mini-me was thrilled with the outcome! I am thrilled! What a beauty. Young Goddesses just wanna have fun! PHOTO OP: Ashlie congratulates Belén Soto’s Black Drake on his upcoming wedding. The above shot was in contention for the opener. Blow it up & see my dilemma. All the small pics blow up. Ashlie makes a beautiful Goddess and is an excellent model for not being a model. And you are a wonderful photographer, Resa. You did a great job capturing the mood of the dress and your Goddess. 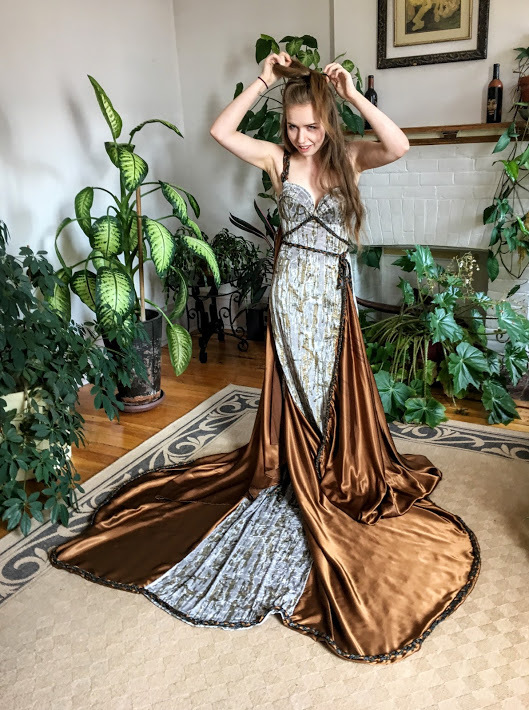 “Artemis by Moonlight” is a beautiful gown, but I’m not sure you could make a gown that’s not a beautiful masterpiece. Ashlie is so beautiful, and I also think she did a great job modeling Artemis. Thing is, she was just natural. She didn’t know any model tricks or poses. She was simply herself. I feel very exhausted after posting this. I suppose it is because I love her so very much, and to see her all grown up and beautiful …. well… there are many emotions. I am grateful that I got to capture my sweet dear Ashley as a Goddess. Very beautiful, both Ashlie and the gown. Nice photo job, my favourite is the vignette style with the hair cascading at the same angle as the back of the gown. Lovely. Thank you so much! This means a lot to me. I had no idea I was going to react so emotionally to this post. I am so happy you are here! Emotion is so central to creativity, so it makes sense that it blended with your other talents (apparently including photography) at that moment. Love it. 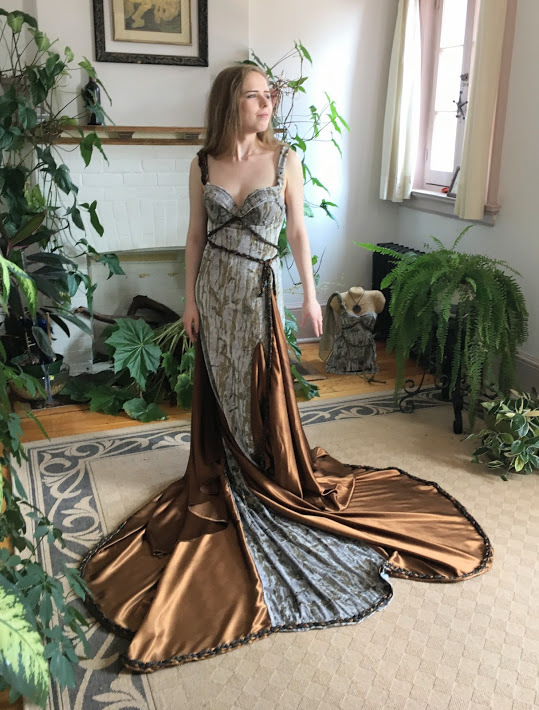 Gorgeous creation, the gown and the young model! What a gorgeous gown and a beautiful niece! 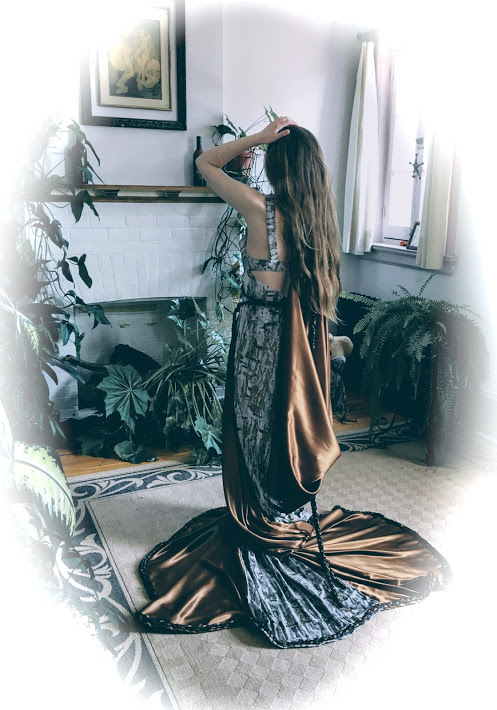 I love the bodice and the shimmer of the bronze fabric in contrast to the stone-like texture of the other fabric, giving it a living statue effect. Just stunning! Wow, Brenda, I love your description! Your imagination is wonderful! I hope your fairy gown will come out so well. Of course, gossamer would be a better achievement for a fairy! I’m starting Ralph’s “Humour” gown shortly, Then it will be the fairy. 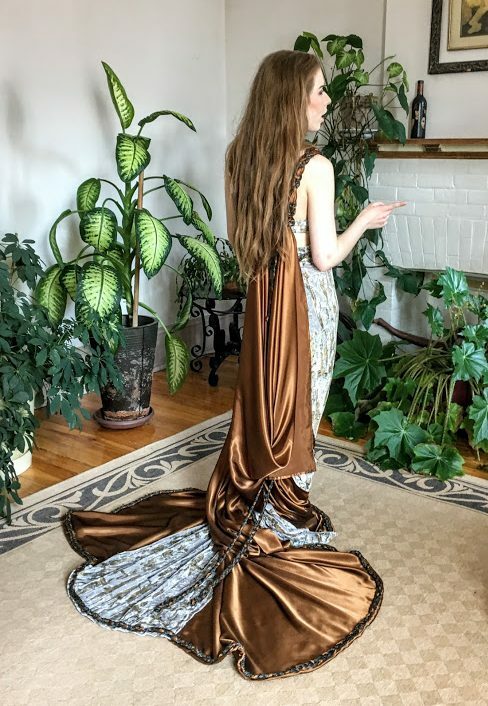 Maybe some of your filler posts could be illustrating the journey of making it — inspiration, anecdotes, sketches, purchasing trips, pattern, cutting, pieces sections, refining idea, ironing, facings, braiding trim, then the piece de resistance (forgive the lack of accents, no idea how to put them in here), the finished garment. Then the “fillers” would be “teasers” instead. Interesting idea! Teasers…. Definitely pondering on that one! I always like seeing how you prepare the fabric, painting, distressing, braiding. If you did it before the big finale, it would be intriguing. Beautiful girl, beautiful gown/ What could possibly be better! Oh, and excellent photos too! Ashlie is so gorgeous! It was a real treat for me to photograph her in my work! By the way, those Mandarin Ducks you posted are gorgeous! They look like they are wearing Duck Gowns! However, your tux needs to get control of its emotions and bow ties! Does it know how difficult it is for a tux to immigrate to Canada? Lol, lol! Maybe it is easier to hire the snappy guard dog, again! If society deemed it acceptable for a 6ft man bloke to wear a gown such as this, then this is the gown I would wear. Bloody outstanding, I say. Thank you so much for your appreciation of this gown! 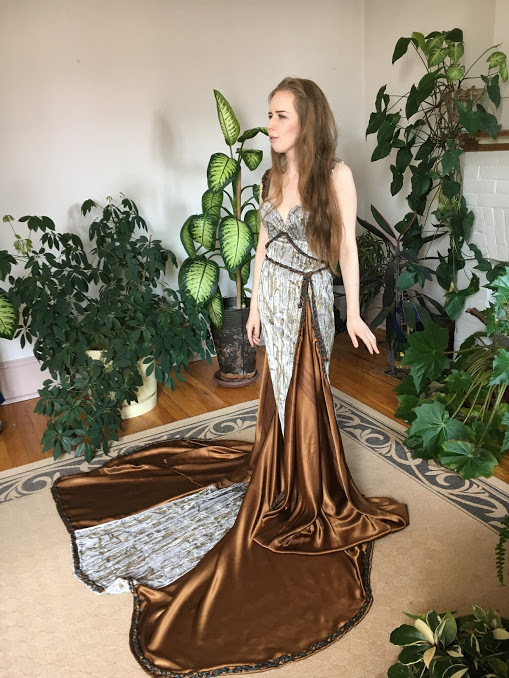 Canadian society would happily allow you to wear this gown….but it seems, according to a recent post on Professional Moron, you would need to lose 26 stones (about 365 lbs) to fit into it. Perfectly acceptable, madam, I shall wear only a onesie until I’ve shifted aforementioned excessive pounds. Aiiie. Where will you shift them to? Why not just lose them? Am I caught up in colloquialisms? Yes, this is a very happy post. I am on the moon with happiness that I got to capture my dear Ashley in one of my Art Gowns. Hahaha! LOL! Yes, the gown may have been captured from many angles, but the truth is that I was Shooting Ashley from as many angles as possible. Love makes everything work better! 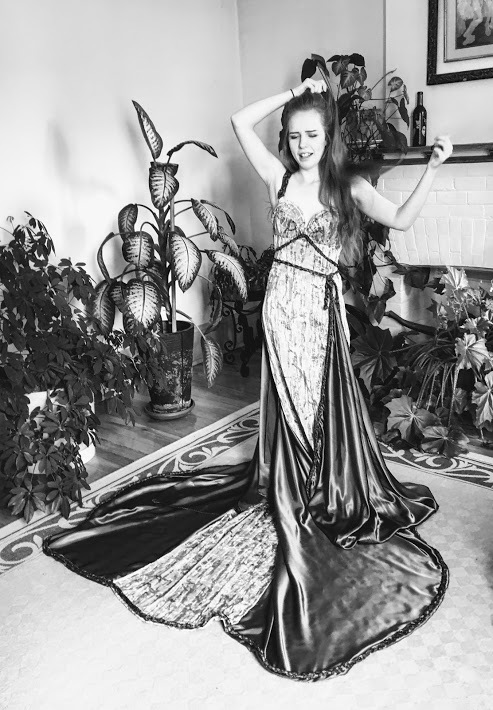 It seemed incredible but you have managed to find a young and beautiful Goddess, with Ashlie your Art Gown is full of life !! All the photos are wonderful and the model performs a very professional session, she’s great. Congratulations to both, you are a family of beautiful artists. Drake is very happy now that he recovers from eating the gold foil and chocolate bells. Strange, his taste for foil? Although, chocolate is understandable. Congratulations on the new look of the blog, is it a new theme? Is a clean and attractive design for the reader. Ah! Entonces, I will not bring any seasonal chocolates wrapped in foil en mi casa.. Yes, it is a new theme. Both of my blogs, and website for work are affected by retired WP Themes. I do my best to change & catch up, pero es mucho travajo. Sol’s gown is finished. Ahora, yo hecho la tiara. 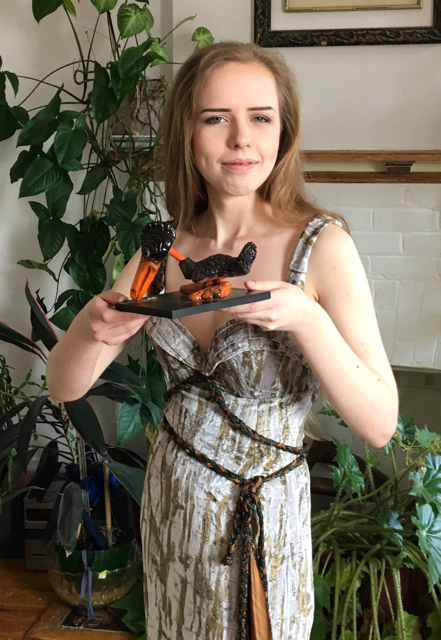 Thanks to you and many thanks to Ashlie for help our duck to live a new moment of glory, is his first photo with a goddess … with the most beautiful !! First of all congratulations in changing your theme. Looking good ! I do hope that the changeover was an easy one for you. Toni was cleaning my apartment today and I showed her this post and we had a bit of fun in knowing that she could have been the one modelling this gown for you. Both Toni and I absolutely love the way your gown was modelled by Ashley. Not only was she very brave, but she showed off your creation amazingly. Well done Ashley .. and .. well done you my friend for taking such lovely photographs and sharing them with us. I have so much to look forward to, don’t I ? Your next gown, Resa, and Drake & Sol’s wedding. ….. well … I do like my new theme…. yeah. Still working on the changeover. Yes dear Ralph, yours is the next “Art Gown”, although I have an interesting post between this and that. I’d like to be more active with Art Gowns, but they take at least 3 months to make. I’m looking for ideas for in between. Say hello to Toni for me. Who took the pictures of her for her portfolio? Kiss the cats.. and … oh yeah, a kiss for you! Your theme looks great and I am sure it will look even better once you are happy with it and finished tweaking. I know. 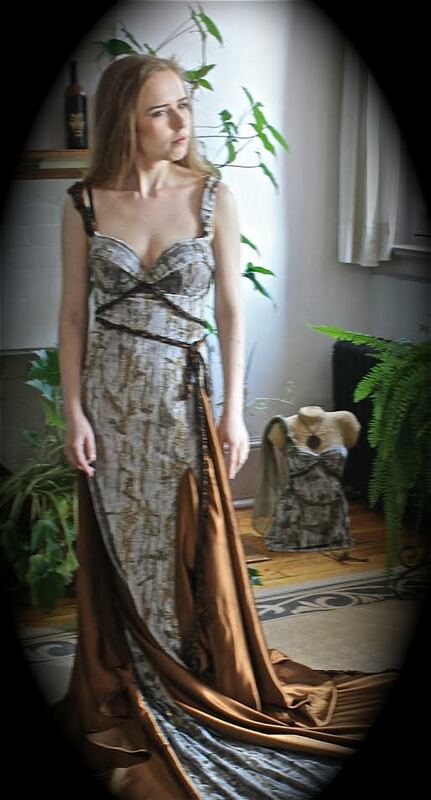 It takes you ages to create such wonderful gowns and I am so thrilled to be a small part of your next creation. Will do. I will pass your hello onto Toni when I next see her. A couple of girls from where Toni works got together and had a photo shoot as a bit of fun. The gown and Ashlie are stunning. I love the way the bronze train seems like an extension of her hair. Your photos are wonderful. I agree! her hair is wonderful. I knew it would be perfect with the gown. Thank you for yur lovely comment! Thank you for your wonderful comment! I’m very proud of both my daughter Ashlie and my Auntie Resa. Thank you for the lovely comment Aquileana! I love you all so much! It was definitely fortuitous that Ash came to Toronto at the time I wanted to shoot “Artemis in Moonlight” on a model. 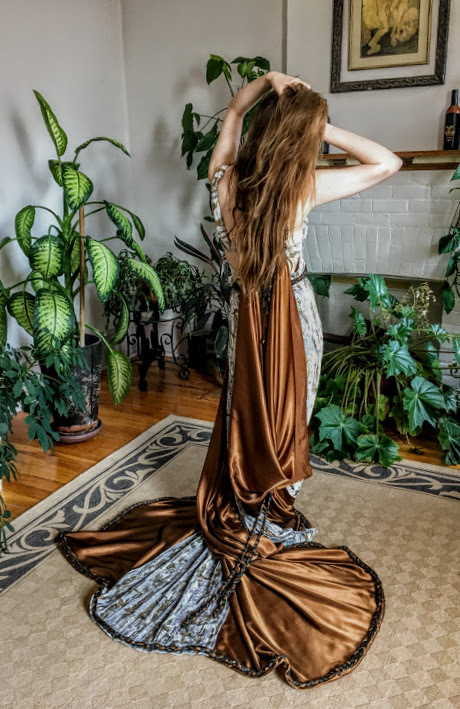 Had Stephanie been here, I’m sure there would have been some more professional shots, nonetheless, I am thrilled to have captured our beautiful Ashlie, as a Goddess. I can hardly wait to see the pictures, in frames in your home, when I come for a visit to Winnipeg! Wow; Ashlie looks absolutely gorgeous in your beautiful Art Gown, Resa; Sherrie must be so chuffed. I particularly love the fourth image; Ashlie looks so ethereal and Goddess-like! OMG!! 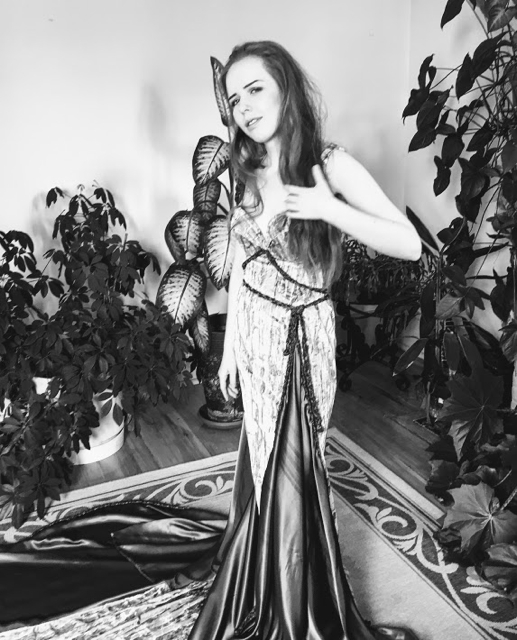 Getting to shoot Ashlie in an Art Gown is definitely a highlight of this year. Ah, the 4th image is a beauty. I cannot begin to tell you how difficult is was to pick out what pics to post, let alone the openers. The new theme is taking time. I feel overwhelmed recently, maybe it’s the new theme. I have to change my website for work as well. and am using the same theme, there. I love that we are both using Lovecraft. Figures! She is gorgeous! and you are so talented! Magnificent! Thank you, I truly appreciate that coming from someone as talented as you are. I’ve always admired your wonderful work! Such a gifted seemstress and designer you are. Working my self for many years in the textile trade. I know talent when I see it. And your garments are beautiful and unique.. And you are a very beautiful model for them.. I came via Aquileana post and your collaboration in the artwork.. The textile trade is not the most fun place, and I admire that you were able to hang in! For me, it is the most fun out here in blog world, when I get to collaborate with blog pals. I was so excited when I found a mural that I could share with Aquileana. Thank you, Jackie! Ashlie is like a goddess to me, and I appreciate your comment! Lovely photos. The dress brought to life. Yes, it is brought to life. Thank you, John! Your opportunity is mine, as well. So it goes in life & the world. You are more beautiful than any of my words can express. Good thing I have my Art Gowns to tell you! Stunning, gorgeous and unbelievable beautiful. I am in an awe. Beautiful photographs too. Ashlie beauty fit the dress. You are an amazing talened designer, dear Resa. I agree with you on Aquileana’s blog. 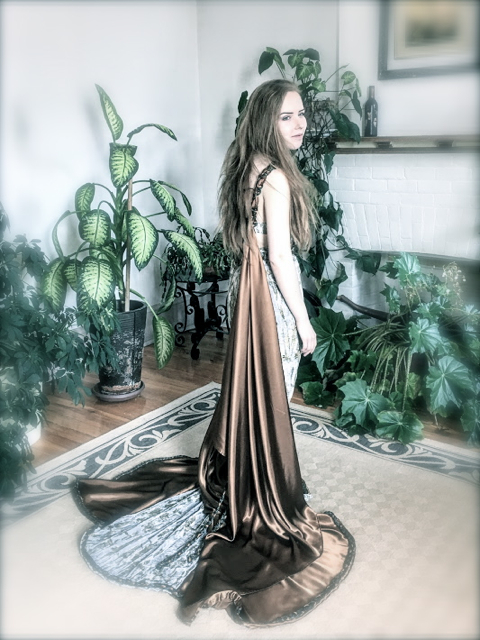 Your great niece Ashlie was the perfect model for your stunning Artemis creation ~ her beautiful, exotic look and long flowing hair added to the allure of this wonderful gown of yours Resa. Congratulations, this is very special. It is very special! Thank you, Mary! What a joy to see my beautiful Ashlie in one of my creations. Her parents are extra thrilled. As a young modern person, she never wears dresses. They are having a special large framed picture made with 4 of the images…. to hang prominently in the living room. Her dad has them as screen savers on his computers and more. Of course I sent them a lot more photos than I was able to post. I am very happy this event happened! Oh how wonderful, your special niece looked stunning and now forever frozen in time with one of your magnificent pieces! Thanks Rob! My beautiful great niece was perfect to model the gown! It was a special post for me to do. 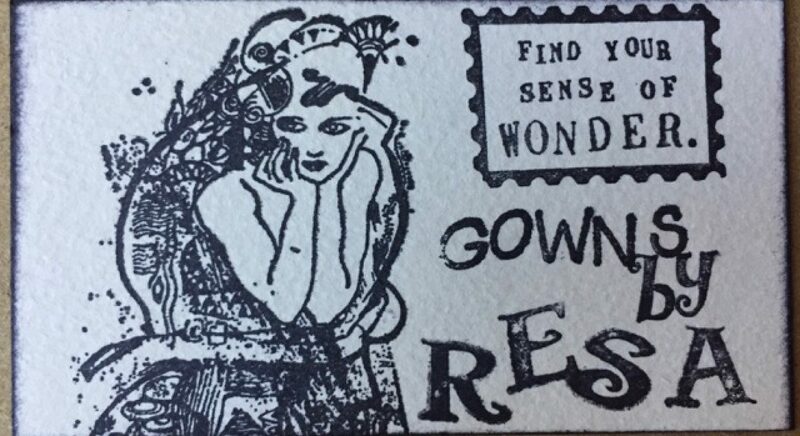 Simply lovely, you creative genius is such a joyful blessing to embrace in my life…your gowns inspire Resa!